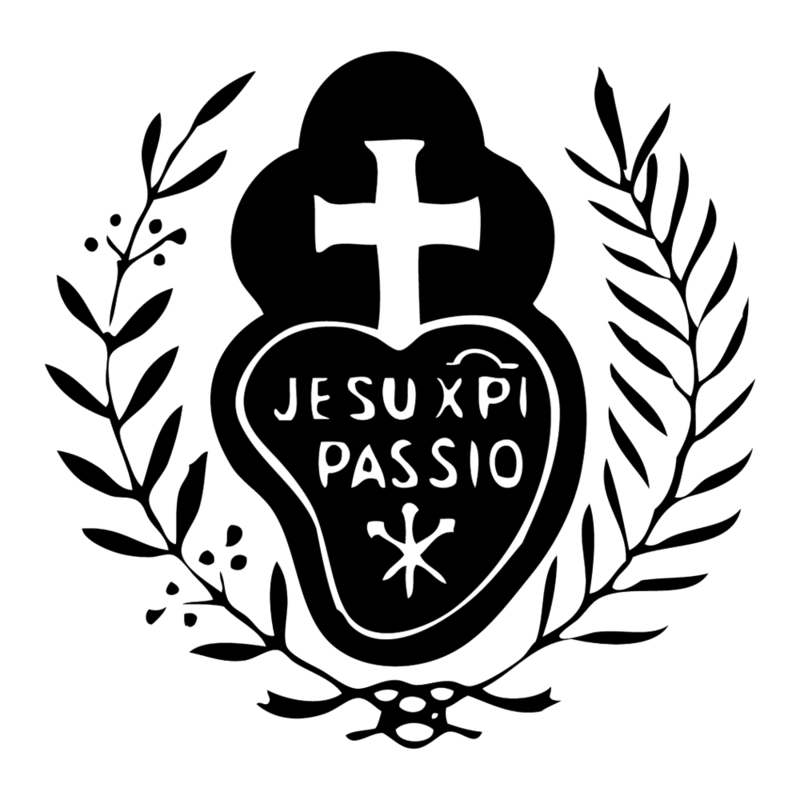 The special insignia of every Passionist is the "Sign" - this heart-shaped emblem. This 'Sign' was given to us by our Holy Founder, St. Paul of the Cross, who described how in a vision he saw Mary, the Mother of Jesus, dressed in black with a badge over her heart. He understood from her that he was to found a Religious Family that would be clothed in the same manner and wear that special badge. That badge was to develop into the 'Passion Sign' as we know it today. The 'Sign' is heart shaped, the symbol of Love. The heart is surmounted by a white Cross, a reminder of the Suffering Love shown by Jesus for us on the Cross. PASSIO - the word Passion in Latin. Thus the text reads - 'The Passion of Jesus Christ'- written in three languages Hebrew, Greek and Latin. Hebrew, Greek and Latin were the main languages used in the time of Jesus, thus they were the languages used by Pontius Pilate in writing the sign he placed above Jesus on the cross. Beneath the lettering within the heart there are three nails - these three nails represent the nails used to fix Jesus to the Cross and are a constant reminder for us, and others, of the Holy Wounds that He bore. Every Passionist Nun takes a special vow to 'promote devotion to and a grateful remembrance of the sufferings of Jesus.' This vow defines the purpose of the Passionist Congregation. We pledge to keep deep in our hearts the memory of the Passion of Jesus and to do whatever is in our power to bring others to the knowledge of Jesus and His great Love for them manifested in His Passion. First, the death of Jesus was no mere brutal execution of an extraordinary Jewish teacher and prophet long ago. No, His death was an event that changed human history forever. God the Father so loved the world that He allowed His only Son to give his very life for us. His death opened the 'gates of heaven' - Jesus died that all might live. The cross becomes the symbol telling us God's love is stronger than death. We Passionists want to tell the world about that Love. We want the world to remember that Love especially those in the world who bear crosses today: the disabled, the sick, the dying, the grieving, those isolated and alone -- all who bear the burden of pain. Jesus shares their burdens and brings them hope. Christians who believe in Jesus find strength in the memory of his Passion. Jesus knew pain and death. He also tasted the victory of everlasting life - His Resurrection. Death is not the final word for those who believe. This, too, is the Resurrection message we Passionists proclaim to the world. This special sign we wear symbolizes our 'life commitment'. We espouse the memory of Jesus' death and resurrection in our hearts through prayer. We share the good news of His Love with all the world. We proclaim it through our prayer, letters, by phone, our retreat house, our newsletters and through our website.